Architectural rendering of the Lake Texcoco ecological park, which was designed by Mexican architect Iñaki Echeverría back in 2010 but replaced by the new Mexico City airport project. Mexico City - Once the home of Lake Texcoco, the land on which Mexico City's new airport was to have been located could become the world's largest urban park, thanks to a project designed by Mexican architect Iñaki Echeverría back in 2010 and the support of the National Water Commission (Conagua). 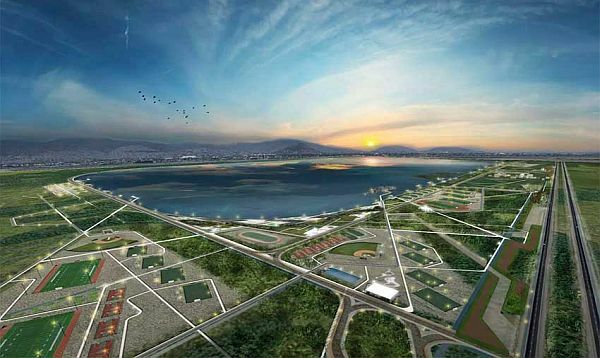 The new director of Conagua, Blanca Jiménez Cisneros, is working to integrate the architect's Parque Ecológico Lago de Texcoco project, which was originally planned to encompass an area of 14,000 hectares, into a 35,000-hectare ecological park that would incorporate nature, culture and infrastructure on the edge of the metropolitan area of Mexico City. The park's design includes a strong environmental focus that Echeverría dubs "cultural ecology:" the architect's proposal includes plans for massive reforestation, the reintroduction of native plant and animal species, and restoration of the lake to replenish the Valley of Mexico's water supply and prevent flooding in Mexico City and México state. If built, the Lake Texcoco park would also include areas for water sports, sailing, biking and hiking and a museum suspended above Lake Nabor Carrillo. It remains to be decided what will become of the partially-built structures at the site of the cancelled airport. According to the law, such projects must restore the site to its original condition.